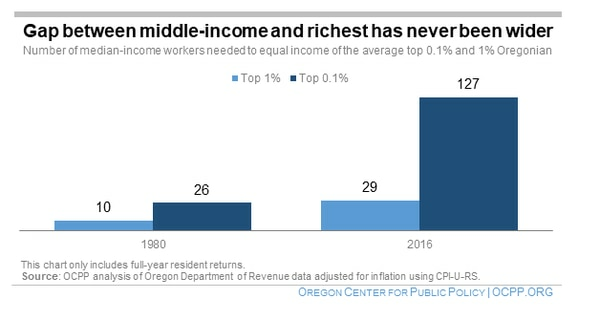 A new study from the Oregon Center for Public Policy calls income inequality "arguably the greatest challenge facing Oregon today." Oregon may be one of the bluest states in the union, but the long-term Democratic control of nearly all levels of government in this state has done little to combat what a new study from the Oregon Center for Public Policy calls "arguably the greatest challenge facing Oregon today." 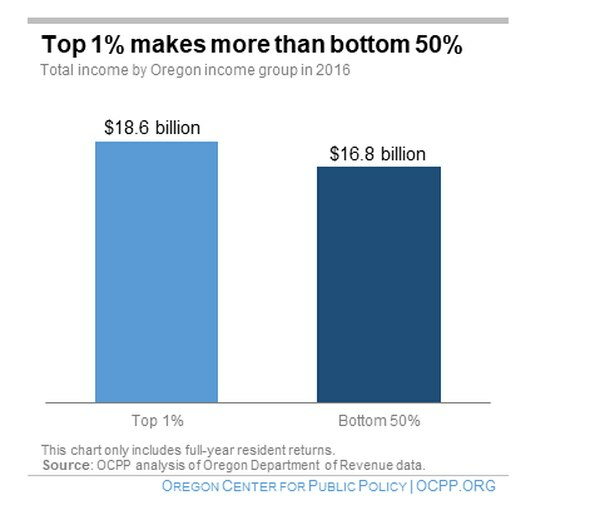 Using Oregon income tax data from 2016, the most recent year available, the left-leaning think tank examined the gap between the state's highest income earners—the top one percent and the top one-tenth of one percent—and average Oregonians. "The income gap separating those Oregonians in the middle of the income ladder and those at the very top has never been wider," the study found. 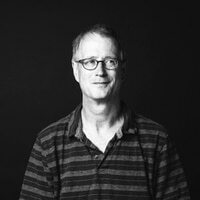 "In 1980, it took 26 typical (median income) Oregonians to equal the average income of the highest-earning 1 in 1,000 taxpayers. By 2016, this had grown to 127 typical Oregonians. 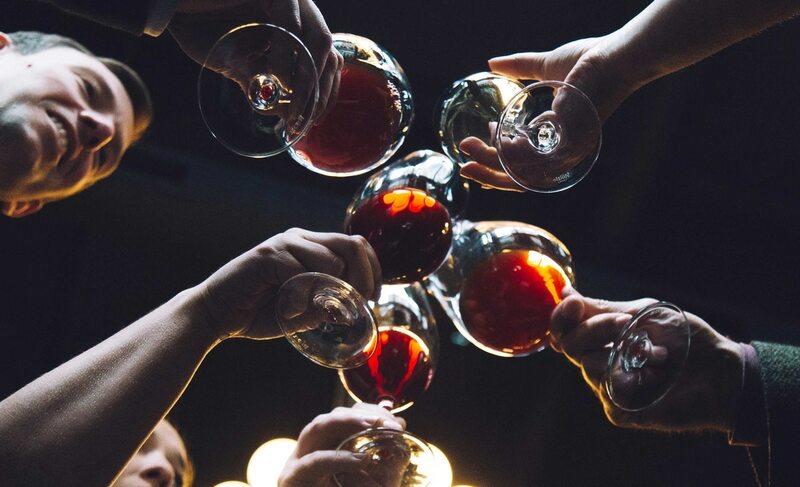 That is nearly a five-fold increase." In 2016, the top one-tenth of one percent of Oregonians earned an average income of $4.5 million. In 2016, the top one percent of earners brought home $18.6 billion in income, more than the bottom 50 percent combined. 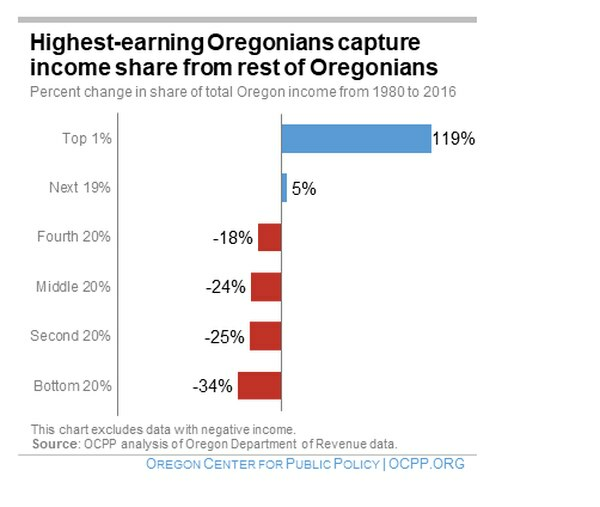 Since 1980, the combined earnings of the top one percent as a percentage of total Oregon income has more than doubled, while people at lower earnings levels have lost ground. In other words, the rich got richer at the expense of lower wage earners, who got poorer. 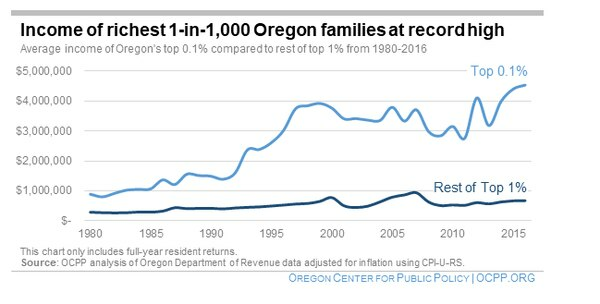 "The highest earning 1-in-1,000 Oregonians are hauling in record amounts of income, at a time when the income of the typical Oregonian has stagnated—and when many struggle to afford housing, child care, and other essentials," the OCPP study concludes. "As the latest data underscores, income inequality remains 'the defining challenge of our time.'"